The sci-fi trilogy Star Wars and action packed Indiana Jones series which are among the highest-grossing films in history are just some of the works of renowned filmmaker George Lucas. Lucas is also the chairman of the production company Lucasfilm Ltd. In 2009 Lucas was named as one of the most successful independent directors/producers in the American film industry, his net worth is estimated at three billion. In 2005 Lucas was awarded the American Film Institute Life Achievement award and in August 2009 he was named as one of the thirteen inductees for the California Hall of Fame, with its ceremony scheduled for December 2009. George Walton Lucas Jr. was born May 14, 1944 in Modesto, California, to parents Dorothy and George Lucas. Comic books, motor racing and cars were just some of his childhood passions. After graduating high school, Lucas went from a community college to a local junior college where he enrolled in liberal arts courses in addition to his main studies. He became attracted to cinema and theater events in San Francisco and decided to enroll in the University Of Southern California School Of Cinematic Arts (USC) to pursue his dream. At USC Lucas met other budding filmmakers such as the acclaimed Steven Spielberg and Randal Kleiser (director of the famous 1978 musical Grease). Lucas also became involved in documentary type filmmaking creating his own projects with such titles as Herbie, 1:42:08, and The Emperor. Lucas graduated from USC with a bachelor of fine arts in film in 1966, and then subsequently re-enrolled as a USC graduate student in film production in 1967. He was hired as a teaching instructor at the U.S. Navy where he taught documentary cinematography. During this time Lucas directed the science fiction abstract film Electronic Labyrinth: THX 1138 4EB, which won first prize at the 1967-68 National Student Film Festival, and was later adapted into his first full-length feature film, THX 1138. Lucas was awarded a student scholarship to become an apprentice at Warner Brothers. While at Warner Brothers Lucas met and befriended Francis Coppola, a UCLA graduate that working on a musical titled Finian’s Rainbow. He became Coppola’s assistant on Finian’s Rainbow, and Coppola provided guidance to his creation of the sci-fi THX 1138. The duo went on to establish an independent studio called American Zoetrope which served as a hub for experimental filmmakers. After the box office failure of THX the studio too began to fall apart. Lucas and Copolla briefly separated with Copolla moving over to Paramount where he subsequently worked on the major hit film Godfather, and Lucas persisting with his own film projects that opened up to his first hit American Graffiti (1973); its huge success made Lucas a millionaire before he turned thirty. Lucas’ his new-found wealth and reputation enabled him to develop the first Star Wars after a few challenges. Star Wars proved to be one of the most successful films of all time and Lucas capitalized on its success when he bought the licensing rights from Fox studio and was able to use profits to setup his own production company Lucasfilm. The animation studio Pixar was founded as the Graphics Group but was later sold to former Apple executive Steve Jobs. 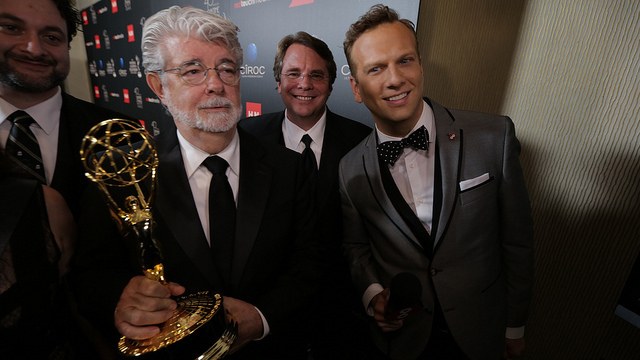 Lucas who was influential in the development of industry-standard post-production tools such as the Avid Film and Video nonlinear editor, went on to make more movies including the Indiana Jones collaborations with longtime friend Steven Spielberg, and the Star Wars prequels. Indiana Jones: Raiders of the Lost Ark won five Academy wards, whilst the Temple of Doom was nominated for two Academy awards and an Oscar. Lucas married film editor Marcia Lou Griffin in 1969. Together they adopted a daughter Amanda in 1981 but were divorced three years later. Lucas has since adopted two more children Katie, born in 1988, and Jett, born in 1993. Lucas, his former wife and children have all taken part in the Star Wars epics. Griffin won an Academy award for work done on Episode IV whilst he and his children have all made appearances in the prequels.